I always appreciate the special touches that people include in life, and its always a delight to receive a beautifully packaged gift. Starting with your next order from April Cornell, your purchase will arrive in a pretty fabric gift bag tucked inside a lovely yellow folder. It's our little way of adding a special touch to your life. The bag can be reused for a myriad of things. 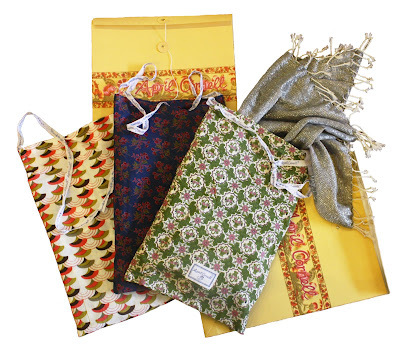 It can be a lunch bag, hold travel items, or be shared as a gift wrap for a special friend. The uses are as wide as your imagination. Each bag is a surprise, and has been cut and sewn in our factory in Delhi. Our way of making everyday beautiful. I just love when I get special packaging. It is such a treat & this is just beautiful! I'm really enjoying your blog stories & the personal info regarding your trip to India. Thank you for sharing.